Send to the GY either 1 Spellcaster monster you control, or 1 other “Spellbook” card from your hand or face-up from your field, except “Spellbook of Knowledge”, and if you do, draw 2 cards. You can only activate 1 “Spellbook of Knowledge” per turn. Finally! A Spellbook for the generic Spellcaster duelist. Spellbook of Knowledge is something for both Spellbook players (what is left of them) and players who run a lot of Spellcaster-Type monsters. A two-for-two however you flip it, you are either losing a Spellcaster on the field, or a Spellbook on the field or in the hand to draw two. Great draw power for both types of decks, and can set up the grave for bigger plays. Dark Magician players needed some extra draw power, despite Allure and Duality being at 3 each. With Eternal Soul out you can send your DM from the field with this, draw 2, then get DM back with Eternal’s effect. Spellbook players have been non-existent since Spellbook of Judgment went on the ban list. This is something the archetype needed, even if it doesn’t result in a rise in Spellbook decks. Other Spellcaster-based decks like Majespecter could benefit from the card. Great draw power card if you have several Spellcasters or play Spellbooks. Draw 2 cards if you control a Spellcaster-type monster. Alternatively, you can use a Spellbook card from your hand or face-up on your field. Spellbook of Knowledge can only be activated once per turn, and you can’t use multiple copies to pay for the effect. That being said, it is more reliable than Wonder Wand since that can be chained to and destroyed. Also, Spellbook of Knowledge is one of the only easily searchable draw cards. Pantheism is better, but this is still really good. Invoked decks love this. Dark Magician decks can use it too. Future potential is high because Spellcasters will always be popular. Until it was revealed, I would of not expected Spellbook support in 2017, yet we got it. Konami is looking to support the ZEXAL archetypes as we got Spellbook support in Code of the Duelist as well as we will get Mermail, Fire King, and Mecha Phantom Beast support in Circuit Break. What’s next? Geargia? Madolche? That could be fun. Back to the topic, we are reviewing Spellbook of Knowledge today (don’t worry, it isn’t as powerful as Spellbook of Judgment). Spellbook of Knowledge has that special characteristic that all the Spellbooks have, and that is that they are highly searchable by Spellbook Magician of Prophecy, Spellbook of Secrets, and Spellbook of Power, as well as Spellbook of the Master helping you thin the deck more. Spellbook of Knowledge is another Spellbook that really helps assist in deck thinning, as you can send a Spellcaster monster from the field to the GY or a Spellbook from your hand or face-up on your field to the GY to draw two cards. Destiny Draw was at one point limited for a good reason, drawing cards is powerful, especially if there is a powerful engine for the draw card. Just run two Spellbook Magician of Prophecy, two Spellbook of Secrets, and three of this card and you got a very good draw engine going for you. That or if you are playing an Invoked engine, you don’t have to worry about the Spellbook Magicians, just get yourself some Aliesters, Magical Meltdowns, and Invocations as well as the Invoked fusions, and you got two great engines in one deck. Even the Windwitches have synergy with this because they are Spellcasters. This card with a Spellbook and maybe Invoked engine will help make True Dracos more consistent if they suffer the same hits over here like they did in the OCG. You can only activate one of this card per turn, but it makes it far from terrible. This card just revived Spellbooks in the competitive meta. 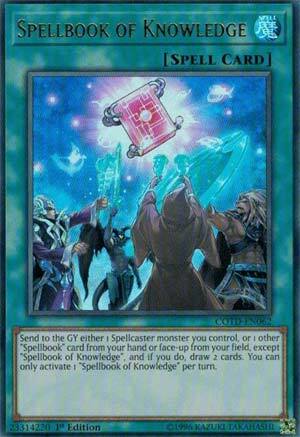 Todays card of the day is Spellbook of Knowledge, a normal spell card from Code of the Duelist. Spellbook of Knowledge lets you send a spellcaster from your field or any spellbook card from your hand or face-up on the field to draw 2 cards. Granted though, you can only activate a single copy of it per turn, but it is still a really powerful draw card if used correctly. Knowledge has found its way into a few decks, alongside Spellbook Magician of Prophecy as a small, but very potent, search and draw engine. Alex Searcy Spellbook of Knowledge, arguably the best card we look at this week, (you should know I like to incorporate something Spellcaster related into my weeks) is a good, balanced Draw card for a Spellbook player. It’s a 2-for-2. You give up this card, plus either a Spellcaster (no specifics as to position on the Field) or one other Spellbook card (other than this, and that’s not bad either, as they can easily cycle back to your Hand) to Draw two cards from your Deck. To keep this card from being ‘broken’ you can only use one a turn. But it’s still an even and fair card. You should certainly use one if you’re playing Spellbooks.